Today (Sunday) was the highly-anticipated second and final day of the inaugural Baku Grand Slam at the “Sarhadchi” Sport Olympic Centre. In a thriving city where sport is at the centre of the Azerbaijan public’s hearts the Grand Slam was warmly embraced as athletes and delegates were met with great hospitality and respect. The fanatical home supporters were treated to a thrilling second day as their judoka emerged to the fore to top the medal table with three gold medals. 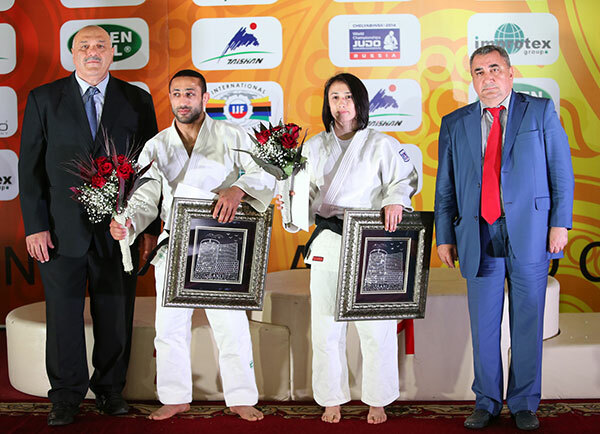 Seven weight categories were in action as the women’s -70kg, -78kg, +78kg categories and men’s -81kg, -90kg, -100kg and +100kg categories all took to the tatami. Before the final block, Mr. Vladimir BARTA, IJF Head Sports Director, made a special 6th dan presentation on behalf of Mr. Marius VIZER, IJF President, to Azerbaijan national hero and two-time Paralympic champion Ilham ZAKIYEV who won a bronze medal at the London 2012 Paralympic Games. Mr. BARTA is a personal friend of the much-admired ZAKIYEV and closely followed his progress in London on video calls with London 2012 Judo Manager and IJF Sports Commission member Dr. Lisa Allan. After making the presentation, Mr. BARTA said: “I have in my office a picture with ZAKIYEV from several years ago from here in Baku which means a lot to me. I've followed him closely since then and I was talking to Lisa Allan during the Paralympics and so I was able to congratulate him on his result immediately. 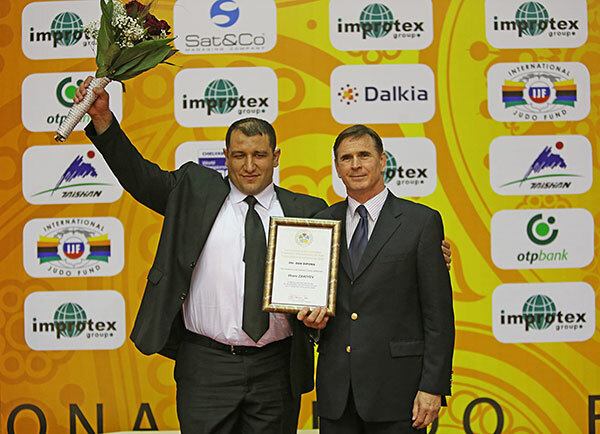 ZAKIYEV was delighted to receive a richly-deserved promotion before his adoring fans and at such a prestigious event. “I’m so happy, it’s a huge honour,” said ZAKIYEV who received a standing ovation to show just how highly he is respected in Azerbaijan. 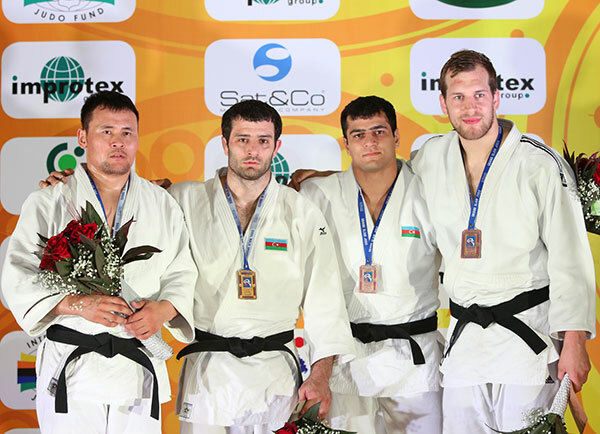 ZAKIYEV also reflected on his country’s first Grand Slam event and the efforts his fellow Azerbaijan judoka. There was also awards for the most successful judoka and best ippon. 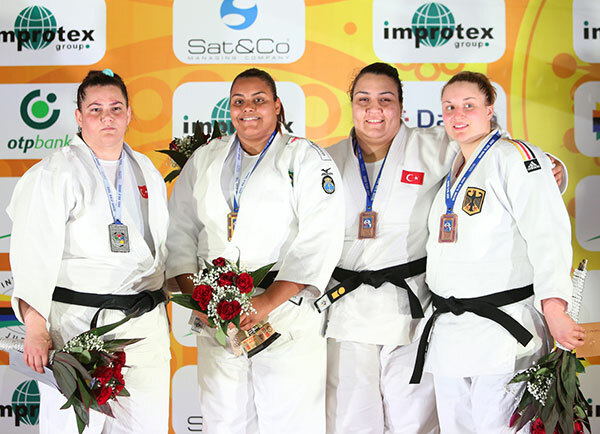 Levan TSIKLAURI (GEO), who won -81kg gold, was awarded the best male athlete prize while Yarden GERBI (ISR), winner of the -63kg title, received the best female award. 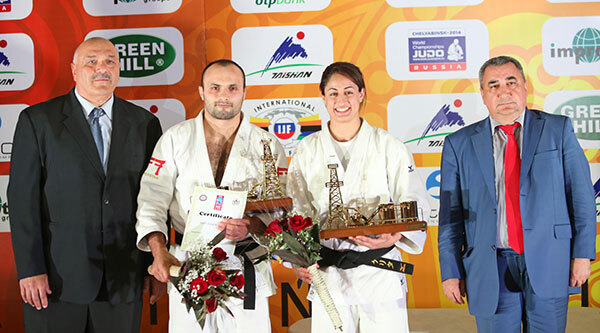 Nijat SHIKHALIZADA (AZE), who clinched -66kg silver, was awarded the best male ippon while Ebru SAHIN (TUR), winner of the -48kg title, received the best female ippon award. Kelita ZUPANCIC (CAN) entered the event knowing victory who move her to world number one and achieved exactly that by overcoming European bronze medallist Laura VARGAS KOCH (GER). Kelita ZUPANCIC seized the moment against VARGAS KOCH (GER) who last graced a Grand Slam medal podium with silver in Paris this year. The new world number one ensured a place in the final by overcoming Juliane ROBRA (CAN) by ippon while VARGAS KOCH ended the tenacious challenge from Sally CONWAY (GBR) by ippon with just six seconds left in the contest. The first bronze medal was won by Juliane ROBRA who decisively dispatched Irina GAZIEVA (RUS) by ippon after taking the lead with a yuko. 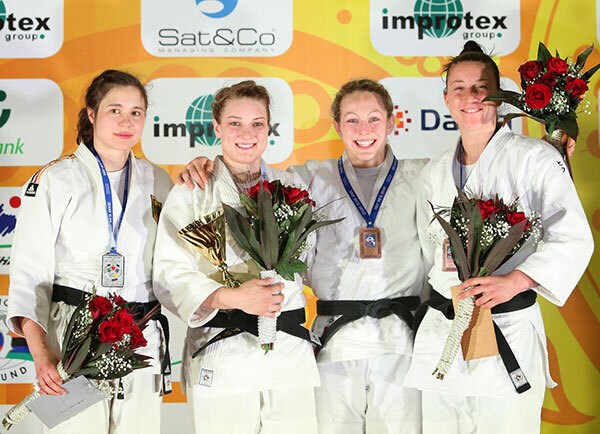 The second bronze medal was awarded to Sally CONWAY who overpowered Barbara BANDEL (GER) to grace a Grand Slam medal podium for the first time and truly alert her rivals to her arrival in the upper echelons of an immensely talented category. European bronze medallist Abigel JOO (HUN) was the big winner in a compelling category which attracted three members of the world top 10. Abigel JOO won by shido penalties awarded against world number 13 Luise MALZAHN (GER) as the hugely talented Hungarian won yet more admirers in Azerbaijan. MALZAHN booked a place in the final by seeing off the considerable threat of world number seven Catherine ROBERGE (CAN) in the second minute by ippon. JOO reached the final by also defeating a Canadian as world number eight Amy COTTON (CAN) was bested in the second minute and also by ippon. The first bronze medal contest saw Catherine ROBERGE prevail by way of shido penalties awarded to Alena KACHOROVSKAYA (RUS). 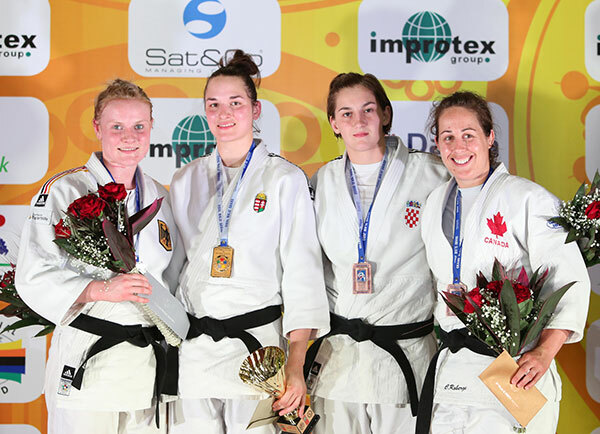 The second bronze medal was won by Ivana MARANIC (CRO) as a waza-ari was the difference against Amy COTTON. Six-time Pan-American bronze medallist Suelen ALTHEMAN (BRA) impressively held down world number seven Belkis Zehra KAYA (TUR) with a mune-gatame for ippon in the opening minute. In an intriguing semi-final stage both ALTHEMAN and KAYA defeated teammates to seal their final spot. ALTHEMAN convincingly defeated three-time Pan-American medallist Claudirene CEZAR (BRA) by ippon in the second minute, having opened the scoring with a waza-ari, while KAYA won by the same manner and in the same minute against Samsun Grand Prix bronze medallist Gulsah KOCATURK (TUR). The first medal was captured by Gulsah KOCATURK (TUR) via osaekomi as she held down Ivana SUTALO (CRO) with a kesa-gatame for ippon. The second bronze medal was won by Carolin WEISS (GER) as the medal tilt of Claudirene CEZAR ran out of steam as she suffered defeat by ippon. Dusseldorf Grand Prix silver medallist Levan TSIKLAURI (GEO) recorded the greatest victory of his career as he defeated former Paris Grand Slam bronze medallist Alain SCHMITT (FRA). Levan TSIKLAURI only received one score against him all day – a waza-ari in the semi-final – in an otherwise faultless display as he proved too strong for SCHMITT. Alain SCHMITT guaranteed a place on the medal podium and in the gold medal contest by seeing off Russian challenger Alan KHUBETSOV (RUS) by a waza-ari. Levan TSIKLAURI recovered from shipping a waza-ari against Rustam ALIMLI (AZE) to silence the home crowd as he surged into the final by ippon. The first bronze medal went to Sergiu TOMA (UAE) who held down Rustam ALIMLI (AZE) whose frustration will be compounded by the fact that he upset London 2012 Olympic bronze medallist Antoine VALOIS-FORTIER (CAN) in his opening contest. The second bronze medal was awarded to Alan KHUBETSOV who saw off the challenge of British number one Thomas DAVIS (GBR) by waza-ari. Former junior world bronze medallist Shahin GAHRAMANOV (AZE) and three-time European champion Valentyn GREKOV (UKR) met in an enthralling final where both men were going all out for ippon and had a receptive crowd on their feet. Shahin GAHRAMANOV received the loudest reaction of the day when he lifted up GREKOV with a ura-nage for ippon. The home judoka booked a place in the final by conquering Kamil MAGOMEDOV (RUS) in a nail-biting semi-final while Valentyn GREKOV made his way to final two by toppling compatriot Stanislav RETYNSKYY (UKR). The first bronze was won by Dusseldorf Grand Prix bronze medallist Zviad GOGOTCHURI (GEO) who prospered against Stanislav RETYNSKYY by ippon. 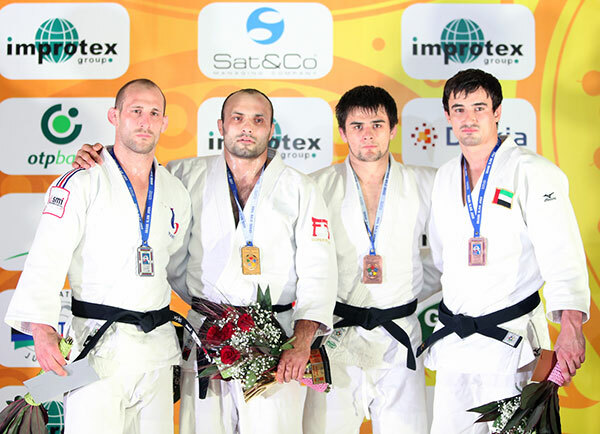 The second bronze medal was captured by Samsun Grand Prix bronze medallist Alexandr JURECKA (CZE) who enhanced his growing reputation by throwing Kamil MAGOMEDOV for ippon. 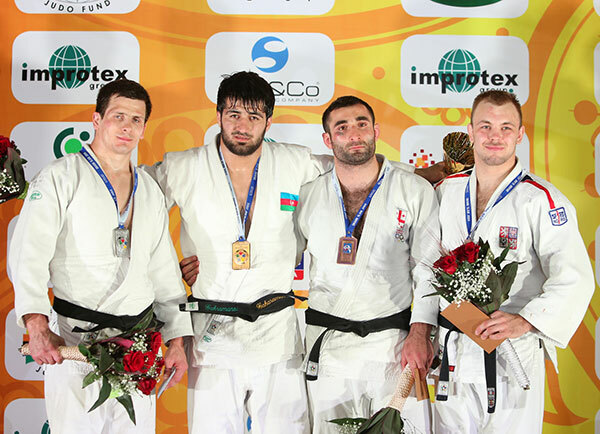 Former world bronze medallist Elkhan MAMMADOV (AZE) was imperious on home soil as he won all four contests by ippon including his final against former Mongolian national champion Enkhbat ERDENEBILEG (MGL). Elkhan MAMMADOV turned to look up to the Azerbaijan flag as he proudly stood on top of the -100kg while the national anthem played. Elkhan MAMMADOV bested Viacheslav DENYSOV (UKR) by ippon in a rapid semi-final contest which lasted 68 seconds. ERDENEBILEG defeated former Paris Grand Slam silver medallist Yauhen BIADULIN (BLR) by a waza-ari and yuko at the same stage. The first bronze medal went to one of the hosts’ brightest talents as top seed Elmar GASIMOV (AZE), who finished in seventh-place at London 2012, was awarded the win with Viacheslav DENYSOV unable to compete due to injury. The second bronze was won by Dusseldorf Grand Prix bronze medallist Martin PACEK (SWE) who held off Yauhen BIADULIN to win by waza-ari. World number 14 David MOURA (BRA) lost out to world number 28 and teammate Walter SANTOS (BRA) who sealed the top spot on the medal podium by ippon in 75 seconds. 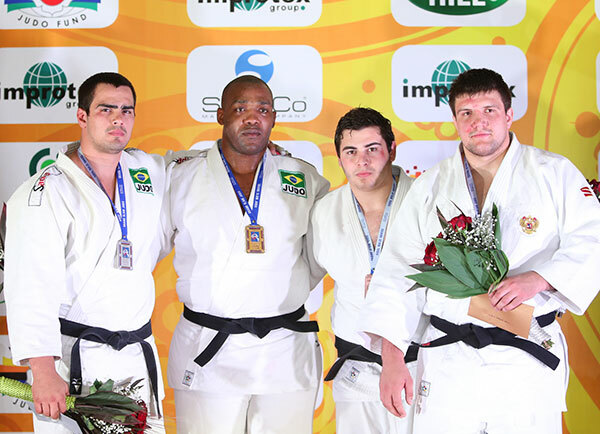 The final between SANTOS and MOURA, their highest-profile meeting to date, was a result of SANTOS blasting Sugarjargal BOLDPUREV (MGL) for ippon in 21 seconds and MOURA toppling Andrey VOLKOV (RUS) with a thunderous ko-uchi-gari for ippon. Andrey VOLKOV and Sugarjargal BOLDPUREV both bounced back from semi-final defeats to fight for bronze. VOLKOV clinched the first bronze medal with a masterful showcase of shime-waza against Vakhtangi BITIEV (AZE) while BOLDPUREV was undone against teenager Levani MATIASHVILI (GEO) who showed great maturity to win by ippon and clinch the second bronze medal.